53 condominiums and 26 town homes of Los Altos Peninsula Real complex by Silverstone Communities at the corner of El Camino Real and Los Altos Avenue on the border of Los Altos and Mountain View is expected to open summer 2008. Peninsula Real is located just a few block from 5100 El Camino Los Altos where only three units left for sale. Condo units are priced from $469,880, while townhomes from $839,880. Peninsula Real Los Altos has HOA starting from $340 for one bedroom units. Peninsula Real Los Altos replaces Round Table Pizza, Red Lobster restaurant and a few lots of wild vegetation. 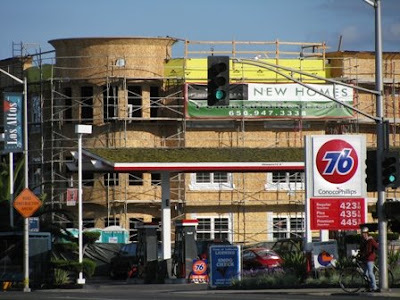 Unfortunately, the lonely Union 76 gas station would still remain at the corner lot, although it would have made a more architectural and economic sense for city of Los Altos and Silverstone Communities to develop the entire corner property as Peninsula Real Los Altos complex. Peninsula Real is served by a K-8 school district, the Los Altos School District, and 9-12 Mountain View-Los Altos Union High School District. Santa Rita Elementary and Egan Junior High schools will serve students from community in grades kindergarten to eighth. As for grades 9-12, students will attend Los Altos High School.